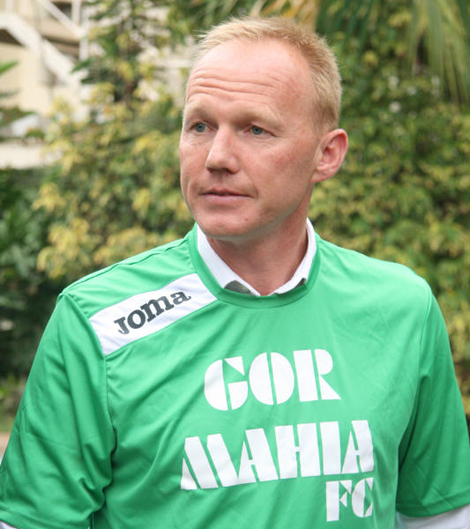 Gor Mahia coach Frank Nuttall has added his voice to those seeking sponsorship for Gor Mahia. According to Nuttall, the working conditions are difficult due to the financial constraints faced by the club. I have been trying to improve and professionalize our training environment since I came to the club but for various reasons, including financial limitations, I have been unable to do so. I believe if we get sponsors to take care areas such as training ground, training equipment, gym and first aid kits supplies, it will be a big boost to us,” said Nuttall to the club’s site. The coach appeared to re-iterate what was posited on this blog yesterday which is that the club need not find a big sponsor. They can work with smaller sponsors as well. It is good to see the coach showing this kind of passion and commitment to the club. He is right. Gor Mahia need not find a big score sponsor like Tuzo or Molo milk. The club can seek out smaller sponsors and work with multiple sponsors. 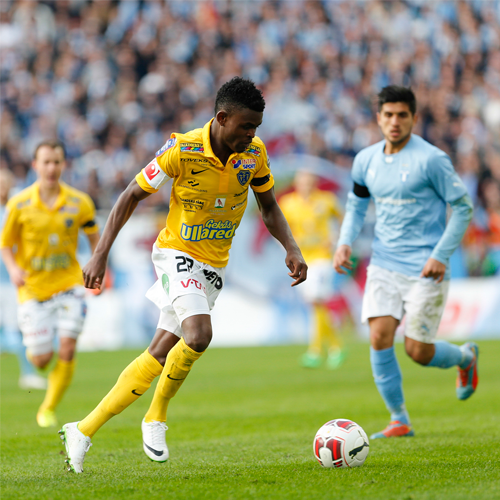 Certain clubs in Europe have multiple jersey sponsors and even short sponsors such as the one below. You and me will through Gor Mahia Sacco and maybe other initiatives. Forget this mambo of separate entities the Sacco must buy the club outright. May that be the top most agenda. Why is the Sacco using Gor Mahia’s name to attract membership and gain mileage only to restrict itself to lukewarm CSR activities. 1. Giving the club shs.100 out the one off registration fee is a joke. 2. Adopt A Player may lead to other players being “orphans” lets replace it with a salary fund. What is the income from Gor Mahia bread. Its been there for about 20 days and if 130,000 pieces are being sold per day that’s kshs.2.6M. The problem with Gor Mahia fraternity is we simply don’t follow thorough. Hence the pertinent question in the previous blog. I strongly agree with the coaches the small sponsors can come on board and help the team especially water companies, petroleum companies etc etc. this in turn will ease the money burden the team is facing now and in turn boost the morale of players as well. I believe one major reason for forming gor sacco was because of the club gormahia. I find it strange for the two to exist as separate entities. Surely training ground, training equipment, first aid and gym are missing….salaries are missing…..so where does all the money go to ? here is my thoughts….a sports club !! you see if GOR MAHIA SACCO can buy land and put up a sports club then all our problems will be sold. the club can make use of all the sports club facilities including gym for free and rent out to members at discounted prices and non-members at market prices. this will be revenue earning for GOR MAHIA SACCO whilst promoting the welfare of both players , members and the community alike. hii mambo ya donating kshs 100 to Gor Mahia as if it is a CSR activity hapana taka !!! SACCO members I hope you are listening !! @Jakoyo stop confusing people. if you do not want to support this positive initiative, you can keep your money. The research showed that if you are associated with GOR MAHIA, you are expost up to 60%, but GM can’t get proper sponsor because of two things 1) CORRUPTIONS, 2) AGWAMBO. If I can explain number (2) a bit, some Companies feared to be associated with GM, because many Kenyans and even Foreigners regards NO:2, as unti-Goverment, so they think their Conpany will also be branded as Unti- Goverment. So where do go should Agwambo requish his Partronship? Jokama duoka uru!!!! As I said Coach Nuttal is a man on a mission. He knows where he is going. However, he is saying we need to walk along with him. Looking at the things or areas he mentioned, they are vital. Field work alone is not sufficient in the current world. Those Cooperates, individuals with big and small muscles please give support that is so needed. The coach even offered himself to be a contact person, I mean that is a man who is ready to go an extra mile for the club. To any would be sponsor who is waiting for a perfect time, this is the time.” Akufaaye kwa dhiki ndiye rafiki” “A friend in need is a friend in deed” To the discouraging voices, There will never be a perfect world that is trouble free. Human beings are human beings. Their characters show in any sport that they have given themselves. I think we are doing our “the Kogalo family” best to educate with the objective of a good image. I hope as we propose changes and improvements to the SACCO we are doing it as members. Note that however much we shout but as non-members then nothing doing. Again note that we cannot start decorating the house before you complete building it. It’s good to criticize, especially constructively, but at times the job has to be done by someone. @ODUOR12 as our most knowledgeable member when it comes to SACCO matters I hope you will be a delegate or a senior person in the SACCO to provide us with the way forward. Otherwise let’s join then ask for the changes so that we don’t appear to be DOMO DOM yet the club needs as like never before. With news of Rama Salim and Sserunkuma signing for Gor in June is news to welcome and to add that quality to the already on fire Olunga, Kagere and Abondo ‘Giniwaseyombogo’. As 12th man lets support the club both financially through GORMAHIA SACCO and also physically in the field. @mwaki p@dan @jakoyo,what if we as fans organise a walk to one of these big company say safaricom,airtel,TOtal,and forward a good business plan to them dont you think it can work. i normaly admire some of the ideas you guys put across,and of late pple have toned down on abuse in this site.Let us petition these companies to sponsor Gor there is tenfold profit in sponsoring Gor.Let the customer seek the goods out,by doing these we might know why they hold reservation in supporting us. @dawaplus, your proposal is quite good. My fear is that the walk might be interpreted as one of those Haki Yetu walks. I think any good business plan does not require a big crowd. You just need to get a few real Gor men and women and you will have an opportunity to hear them on why they have continued to grow cold feet. And I think then you will also be given opportunity to explain your position. The excellent thing about your thought it shows that we are not just leaving things to the EC. It takes all of us. Congratulation. I joined the SACCO last evening but it was a struggle to get to know the registration fee. There is something funny about how this matter is being handled. I am online almost day and night but it was challenging to get more information that i needed online. I wonder what a willing member in the village will do to get information. The facebook page was last updated on 15th April and there are no resources to back up this good thing. Bwana Chairman, why are you doing things the Gor Mahia way? The ‘Just a Little Information is Enough’ way. We were told you are a serious banker and you know that people’s money is a serious matter. Please don’t let this project become like the Chase Bank membership drive. during the time we were contributing for players motivation kit through anelka i know he remained with Gor mahia fans phone no.for those who contributed.we should mobilize so we as fans do something on the search for a sponsor and also promise the potential sponsors that their money will cater for the agreed overheads,we as fans will act as watchdog on the money and market the sponsor positively to others.